SniPCAP is improved and now streaming! 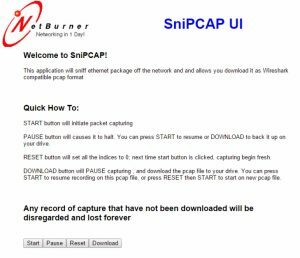 The previous version of SniPCAP was only a minimum product that temporarily captured a small amount of data; increased scalability and better usability was a necessity (more details on the first part of this project could be found here). This article shows the development of a more scalable product on the NetBurner Module. Use of a packet sniffer in government agencies has always been a controversial topic. You might ask, “what is packet sniffing and what can it do?” A packet sniffer is a software or hardware tool that can intercept and log traffic on an Ethernet network.